Moss species (Homalothecium lutescens, Hypnum cupressiforme, Brachythecium glareosum, and Campthotecium lutescens) were used as suitable sampling media for biomonitoring the origin of heavy-metal pollution in the lead–zinc (Pb–Zn) mine ‘‘Toranica’’ near the Kriva Palanka town, Eastern Macedonia. The contents of 20 elements—silver (Ag), aluminum (Al), arsenic (As), barium (Ba), calcium (Ca), cadmium (Cd), cobalt (Co), chromium (Cr), copper (Cu), iron (Fe), potassium (K), lithium (Li), magnesium (Mg), manganese (Mn), sodium (Na), nickel (Ni), Pb, strontium (Sr), vanadium (V), and (Zn) were determined by atomic emission spectrometry with inductively coupled plasma. Data processing was applied with combinations of multivariate statistical methods: factor analysis, principal component analysis, and cluster analysis. 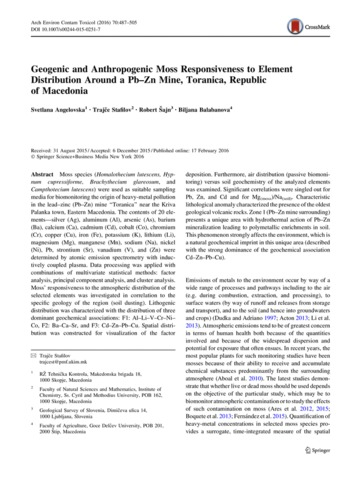 Moss’ responsiveness to the atmospheric distribution of the selected elements was investigated in correlation to the specific geology of the region (soil dusting). 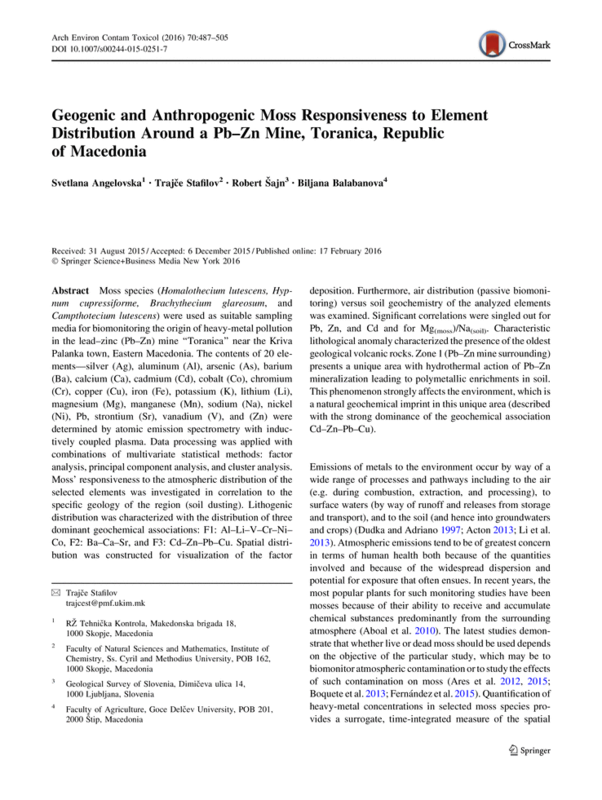 Lithogenic distribution was characterized with the distribution of three dominant geochemical associations: F1: Al–Li–V–Cr–Ni– Co, F2: Ba–Ca–Sr, and F3: Cd–Zn–Pb–Cu. Spatial distribution was constructed for visualization of the factor deposition. Furthermore, air distribution (passive biomonitoring) versus soil geochemistry of the analyzed elements was examined. 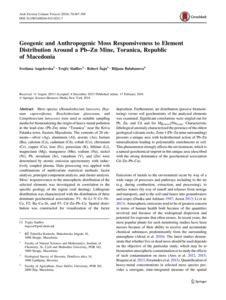 Significant correlations were singled out for Pb, Zn, and Cd and for Mg(moss)/Na(soil). Characteristic lithological anomaly characterized the presence of the oldest geological volcanic rocks. Zone 1 (Pb–Zn mine surrounding) presents a unique area with hydrothermal action of Pb–Zn mineralization leading to polymetallic enrichments in soil. This phenomenon strongly affects the environment, which is a natural geochemical imprint in this unique area (described with the strong dominance of the geochemical association Cd–Zn–Pb–Cu).